Integrated with SMD 3in1 technology, P6 led screen is one of the most widely used models for indoor fixed applications requiring high video clarity at close viewing distance. 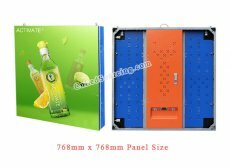 The best price above is based on per panel size of 768mm x 768mm, EXW term, and it is not included with receiving card. -Calibration technology on the LED lamps is supported. -Widely used for both fixed and rental installations. - Double sides, curve shape can be customized. - User friendly software operation, all programs can be digitally edited.